Even Kitty couldn’t resist Pink Tie polish and lipstick! Guerlain has done it again. By “it” I mean they have managed to delight and surprise with a unique and gorgeous makeup collection, but it’s not just any makeup collection. Guerlain La Petite Robe Noire Makeup is a collection of lip and nail shades that are delicately fragranced with La Petite Robe Noire perfume, and the lippies are gently flavoured with a sweet and delicious taste. Beautiful Guerlain makeup mixed with Guerlain perfume? Yes please, where do I sign? Alone in front of her wardrobe, La Petite Robe Noire is deep in thought. She would need something to add the finishing touch to her inimitable style and twist all her wonderful dresses, that little added extra, that je-ne-sais-quoi that would bring out her femininity and reveal her true personality: mischievous, Parisian, spectacular, seductive, elusive and yet with a distinctive presence… What she needs is, of course… colour! Colour just like her – scented colour! What a delightful collection it is! The lipsticks are somewhat sheer, and have that fun pH adjusting formula that tints the lips adding a slight Stain effect while moisturizing the lips at the same time. I am in serious love with this line! Guerlain sent me a few shades to try and I fell fast. Not to mention the packaging is stunning and looks like the classic Guerlain perfume bottle style. Guerlain Petite Robe Noire Pink Tie with a top coat of My First Nail Polish, my favourite combination! These nail polishes – seriously! 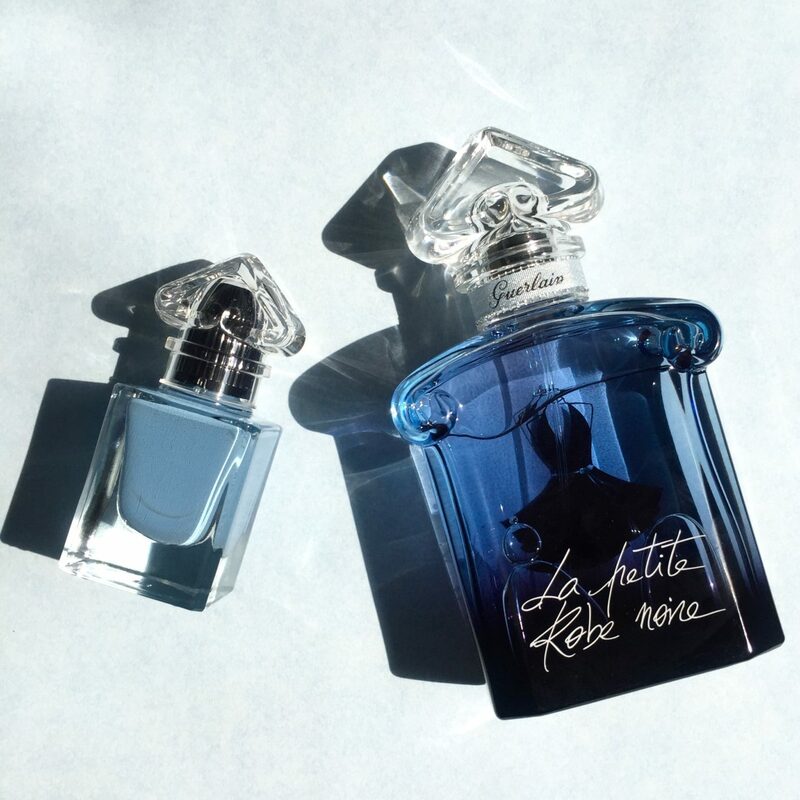 The fragrance of La Petite Robe Noire is noticeable when you first apply them but is mixed with the typical nail polish smell which is somewhat overpowering at first. That lacquer smell goes away when the polish has dried, but I have to admit I was initially a little confused by the perfume scent. I kept sniffing my wrists throughout the day, wondering what perfume I was wearing (sometimes I forget because ALL THE PERFUMES) and then I realized it was my fingernails! Now on one hand I applied a regular top coat and that kills the scent. Ideally one would use the Guerlain La Petite Robe Noire Top Coat to maintain the scent and to refresh it a couple days later. Honestly I loved having the sweet deliciousness of La Petite Robe Noire wafting from my fingertips. Dear Guerlain, might I humbly suggest a special edition lacquer for nails and/or lips to go with L’Heure Bleu, Jicky, and Mitsouko? The Petite Robe Noire lipsticks are definitely my kind of lipstick. They have a soft yummy version of LPRN fragrance and with a touch of a fruity flavour that I love. From Guerlain: A floral fruity fragrance with accents of bergamot, rose and raspberry, inspired by the delicious notes of La Petite Robe Noire, and an exquisite flavour attract tender of passionate kisses. So addictive! They have a pH reactivity that adjusts to the lips, leaving a soft pink stain behind, but the colour is definitely sheer. The finish is slightly glossy, but not sticky at all. They are from the Apply Without A Mirror Lipstick family that I love so much (think Chanel Rouge Coco Shine) that moisturize lips like a balm, while leaving a hint of colour. My favourite shades are Pink Tie and My First Lipstick. They are my newest purse essentials! Get this gorgeous limited edition collection while you can! At select Guerlain counters and boutiques.